Schwartz & Wade, 9780375858994, 40pp. Tad Hills is the author and illustrator of the New York Times bestselling picture books Duck & Goose and Duck, Duck, Goose. He has created four board books featuring the same characters: What's Up, Duck?, an ALA Notable Book; Duck and Goose, 1, 2, 3; Duck & Goose, How Are You Feeling? ; and Duck and Goose Find a Pumpkin. He is also the illustrator of Waking Up Wendell, by April Stevens; My Fuzzy Friends; and Knock, Knock, Who's There? 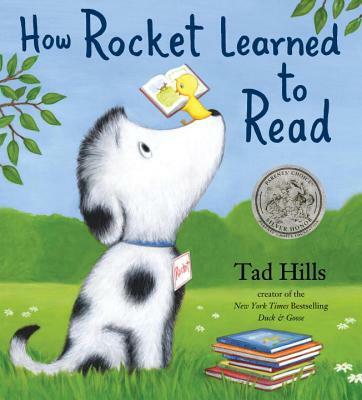 Tad Hills lives in Brooklyn with his wife, their two children, and a dog named Rocket who has not (yet) learned how to read! "A perfect picture book for kids 3-7." "A picture book all about the joys of reading could easily turn preachy and dull. But “How Rocket Learned to Read’’ defies gravity. Rocket is lovable, the little feathered teacher adorable. Hills tells his sprightly story as needed, not one word more or less. His pictures flow with soft color and movement. Hills makes this a story of friendship. It may persuade tentative kindergarteners that school is worth a try; teachers and librarians will love it." "Hills’s gentle, sweet tale is a paean to the joy of reading and the teachers that inspire it." "With characters as memorable as those in Hills’s Duck and Goose series, this good-natured story shows readers how Rocket, a spotted puppy, becomes a beginning reader, thanks to a little yellow bird." "Youngsters will find this addition to Hills’s cast of adorable animal characters simply irresistible."